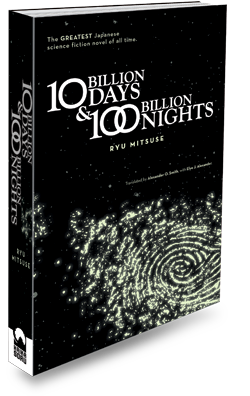 ﻿ TEN BILLION DAYS AND ONE HUNDRED BILLION NIGHTS « Haikasoru: Space Opera. Dark Fantasy. Hard Science. Ten billion days—that is how long it will take the philosopher Plato to determine the true systems of the world. One hundred billion nights—that is how far into the future Jesus of Nazareth, Siddhartha, and the demigod Asura will travel to witness the end of all worlds. Named the greatest Japanese science fiction novel of all time, Ten Billion Days and One Hundred Billion Nights is an epic eons in the making. Originally published in 1967, the novel was revised by the author in later years and republished in 1973. All Things Considered…including THE HEAT DEATH OF THE UNIVERSE! It’s THE INEVITABLE HEAT DEATH OF THE UNIVERSE giveaway contest! Ten Billion Days In The House! Born in Tokyo in 1928, Ryu Mitsuse graduated from Tokyo University of Education with a degree in the sciences, after which he took up the study of philosophy. He debuted with “Sunny Sea 1979” in 1962, and his work—which often combines Eastern philosophy and hard science fiction—includes Tasogare ni kaeru (Returns in the Twilight) and Ushinawareta toshi no kiroku (The Chronicle of a Lost City). Mitsuse made SF history when his short story “The Sunset, 2217 A.D.” was translated into English for inclusion in Best Science Fiction for 1972. With artist Keiko Takemiya, he created the manga Andromeda Stories. Ryu Mitsuse died in 1999. Siddhārtha lay half buried in sand, still as a lump of stone. His tri-D antenna opened slightly, shedding a tiny stream of dust. He could sense his enemy nearby—everywhere, it seemed. No—there he was, not more than a hundred meters away, moving from left to right across Siddhārtha’s field of vision. I wonder what he’s up to? He resisted the temptation to fully extend his antenna. In the quiet that now reigned, even the slightest movement could draw attention from a considerable distance. The release of kinetic energy was one of the easiest to detect. It would be far too dangerous to reveal himself; the last attack had proved beyond the shadow of a doubt his enemy’s hideous strength. Unable to restrain his desire to know, he let his antenna push another ten centimeters above the top of the sand. Unthinkingly, Siddhārtha tensed every muscle in his body. A thousand meters ahead of where his enemy slowly made his way across the flats was his destination—a small black shadow atop a dune. Asura. Jesus of Nazareth was moving slowly, leaving footprints in the sand. The flames and explosions had singed his already tan skin to such a brownness that he threatened to disappear into the desert landscape altogether.